SHOWS: STOCKHOLM, SWEDEN (MAY 24, 2017) (REUTERS - ACCESS ALL) 1. 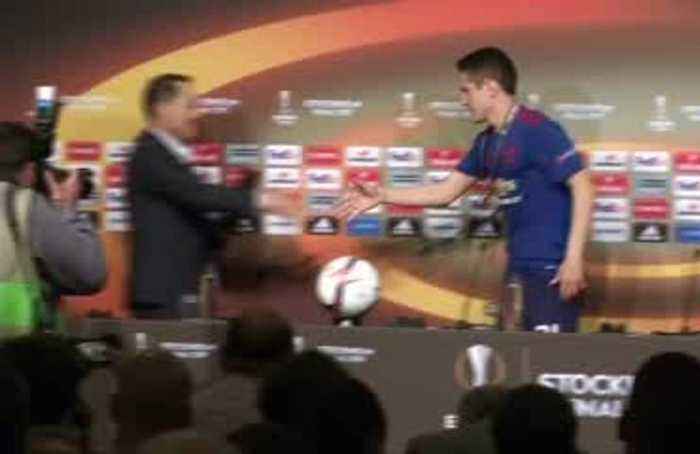 MAN OF THE MATCH FOR THE EUROPA LEAGUE FINAL AGAINST AJAX, MANCHESTER UNITED MIDFIELDER ANDER HERRERA, RECEIVING HIS AWARD PASADENA, CALIFORNIA, UNITED STATES (JULY 22, 2014) (REUTERS - ACCESS ALL) 2. ANDER HERRERA SHOOTING DURING A TRAINING SESSION MANCHESTER, ENGLAND, UNITED KINGDOM (AUGUST 17, 2015) (REUTERS - ACCESS ALL) 3. ANDER HERRERA TRAINING WITH MANCHESTER UNITED LONDON, ENGLAND, UNITED KINGDOM (AUGUST 11, 2015) (REUTERS - ACCESS ALL) 4. ANDER HERRERA AT A PROMOTIONAL EVENT WITH MANCHESTER UNITED TEAMMATES ASHLEY YOUNG, JUAN MATA AND DANNY BLIND STORY: Manchester United midfielder Ander Herrera is rumoured to be nearing an agreement with Paris Saint-Germain. According to multiple media reports, the 29-year-old Spaniard and his current club are not seeing eye to eye in negotiations over a new contract. Herrera's current agreement comes up in June. The Guardian reported Herrera is seeking a raise to about 200,000 pounds ($261,000 dollars) a week from his current 80,000 pounds ($105,000 dollars) adding that the club is offering closer to 120,000 pounds (157,000 dollars) a week.